Generally speaking, an expert is a person with extensive knowledge or ability based on experience or occupation in a particular area of study. So who are our experts...Engineers, Consultants, Peers? The questions listed below come from our customers. Answers are from an array of individuals whose knowledge in these areas can provide sound advise to the questions asked. What Are The Things I Need To Consider When Purchasing Foodservice Equipment? Determine what your real day to day needs are. Are there advanced features and optional accessories that your facility can greatly benefit from or not this being based on your staff's skill sets or current food production needs? Look towards the future. Is there a benefit to purchasing a product feature that you may be able to take advantage of down the road? Staff can be trained and changes to traditional methods are usually beneficial to your long term success. Embrace and reap the benefits of new technology. Bigger isn't always better, less can be more. For example, a larger dishwasher may be able to wash more pieces per hour, but a dishwasher can only wash the number of pieces your employees can physically load at any given time. Make sure your capacities and production rates are realistic. Check the manufacturer's reputation for quality and durability. Due to manufacturing globalization and expanding selection of domestic and imported products available in the marketplace, it is important to make sure the manufacturer and their product(s) have an established track record. Are there spare parts available? Is there a reliable service repair network available to repair the equipment within a short period of time? Are spare parts common and can be sourced through local supply companies or are there numerous proprietary components that are expensive to replace and difficult for in-house serve person to repair? (Given the great achievements and benefits in technology in some foodservice equipment, proprietary spare parts, such as circuit boards and digital controls, will always be proprietary will be unavoidable). Make sure the manufacturer has a thorough training program of the use and general preventive maintenance of the product. Make sure the manufactures/dealer/rep has a follow up program where they come back, assess usage and retrain appropriately. Compare and evaluate the terms and conditions of full and partial warranty coverage. Consider extended warranty coverage on more technically advanced equipment. When replacing larger existing equipment with new equipment, always check the space available to remove the old and delivery access of the new into your facility. Can equipment be delivered in one, or multiple pieces? Will there be modifications to doors and walls to accommodate the change? Will the equipment fit into the elevator? Where Should Crash Guards And Wall Protection In The Building Be Placed To Match Equipment Bumpers And Guards? Hand rails in public corridors are the prime reason for marring portable equipment. Hand rails are installed higher than portable equipment corner guards or bumper heights. Install a wider, thicker molding on the base of the building walls to keep portable equipment from rubbing on hand rails. How Can I Minimize Or Eliminate Electrical Drop Cords? Electrical drop cords can be a nuisance. They often need to be knotted up to clear employees' heads or pull away from ceiling tiles if plugs are not disconnected before moving portable equipment. They also provide visual clutter and are unattractive. A Conveyor can be provided with electrical raceway that is designed for “single point" electrical connections. This means one power supply is fed to the tray line conveyor instead of multiple drop cords. Ancillary equipment, such as air curtain refrigerators, hot food wells and cold stations plug into the conveyor at the point of use making connections much easier and trouble free. Will A Special Electrical Plug Configuration (I.E. Twist Lock Type) Match The Receptacle In A Remote Pantry Or Off Site Location? Certain electrical codes and power configurations will require common, but specific plug arrangements that will be different from a standard 120 volt receptacle. The plug configuration will need to match the receptacle in any remote locations you plan on using the equipment. Speak with you manufacturing rep or dealer for exact configurations. Is There An Easier Way To Push/Pull And Navigate Heavy Portable Equipment Around My Kitchen And Corridors? Use heavy-duty casters with sealed watertight bearings with long wearing, non-marring round edge tires. Round edge (not flat with square edges) tires provide the best movement on carpeted floors and uneven floor conditions like elevator thresholds. Pneumatic tires are also available to cushion cart transport over exterior brick or coble stone pavers if you are moving equipment from one building to another. Innovative equipment manufacturers will use heavy-duty casters with sealed watertight bearings with long wearing, non-marring round edge tires, which provides the best movement on carpeted floors and uneven floor conditions like elevator thresholds. Conveyors: What Types Are Available? Here are four common types of conveyors, listed in order from good to best. Manual with rollers or skate wheels: The simplest type of conveyor typically requires no power, trays are advanced manually. Fabric belt uses N. Rubber over woven synthetic carcass which is FDA approved. The bandveyor uses Dual ½" diameter urethane belts are FDA approved, to move trays. Heavy weight can make belts drag on conveyor table causing premature wear. Slat type continuous belt utilizes flexible flat plastic slats, this is chain driven and is considered the best conveyor design for durability and long life. How Can I Transport Two Portable Cabinets Together And Move Them By One Employee? Consider using a rechargeable battery powered “tug” designed to hitch and pull several cabinets together or, up to 1,500 lb tow capacity. The Tug is an ergonomically-designed motorized tow vehicle used to pull a variety of single or multiple carts in a safe and efficient manner with very little effort from the operator. The tug can be used with any mobile equipment when docked to accessory hitches and hitch receiver tubes. What Are Some Of The Foodservice Menu And Equipment Healthcare Trends? Many foodservice equipment manufacturers will continue to explore and develop more efficient use and less consumption of energy. Energy costs will always be rising until alternative energy sources are developed. Expect ongoing improvements with more conservative use of natural resources such as ware washing equipment using 50 % less water than previous designs or improved efficiency of cooking exhaust ventilation systems. Other developments will be the introduction of more energy management systems designed to monitor and regulate energy usage in a facility, ideally to monitor high energy consuming products like refrigeration systems, HVAC and lighting. Equipment manufacturers will continue to develop foodservice equipment in areas relating to refrigeration with smaller compact sizes that will perform a number of functions like a blast chiller designed to blast chill, shock freeze, rapid thaw, and proof, which allows you to cook, hold, and serve optimal food freshness to the table. Combi ovens will continue to develop simpler to use precision controls offering smart cooking features designed to cook faster, more efficiently, with less shrinkage and better cooking results. More developments in equipment that performs multiple functions - like ovens having microwave, convection, browning and steaming capabilities. Remember the microwave only oven? The precision and energy efficiency of Induction cooking technology will continue to be expand and be improved upon for use in heating plates as well as for heating large stock pot cooking devises. Other ongoing developments to expect will be more Energy Star rated products, more preventive maintenance alerts and self diagnostic features, HAASP controls and recording information as well as the use of LED lighting for better energy efficiency and greater light quality. Display kitchens, cook or salad/sandwich make to order action stations will continue to be very popular given their ability to add theater, sound, aroma and visual appeal of fresh foods being prepared. Asian influenced menu items continue to be in demand and hence the use for wok cooking will continue to grow. Char boilers, for the ever popular hamburger and other meats and fresh baked pizza (scratch or par baked products) and other comfort foods will continue to remain popular. Will Form (Building Column Locations) Or Limited Space Affect The Function? Is there enough space available to park and store mobile delivery equipment when not in use (overnight) or lulls between meal assembly periods? Staging portable equipment is often overlooked and not realized until a facility has been constructed. Insufficient space for these items can be overwhelming and often crowd egress corridors or force you to find alternative areas outside the kitchen area. How Much Space Is Typically Required For A Tray Line Assembly Area? 600 + beds: Consider 2 conveyors 600 or more bed = approx. 500 + sq. ft.
Is There A Standard For How Much Lighting I Need In My Kitchen And Tray Line Assembly Areas? Good task lighting is important in concentrated work areas and provides a better work environment for your employees. For example, menu orders will be easier to read and tray assemble more accurate. 40 to 50-foot candles of lighting in the kitchen and tray assembly area is recommended (Foot candles is a common term used for lighting; a unit of measurement used to determine proper lighting levels for workspaces). In What Ways Does Your Equipment And Overall Layout Save Labor Costs And Create Operational Efficiencies? An efficient equipment layout is essential for the best productivity and labor efficiency. Tray line assembly equipment should be situated in the work area to minimize reach and steps needed to access support equipment. Slim or narrow equipment, along with standard equipment that form an “L" shape work station, can be installed to provide the best ergonomic efficiency. Straddle style starter stations also can provide ergonomic efficiency Use vertical space above equipment for added storage. 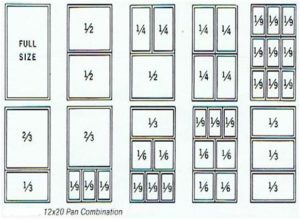 How Many Portions Can I Accommodate In Standard Foodpan Sizes? 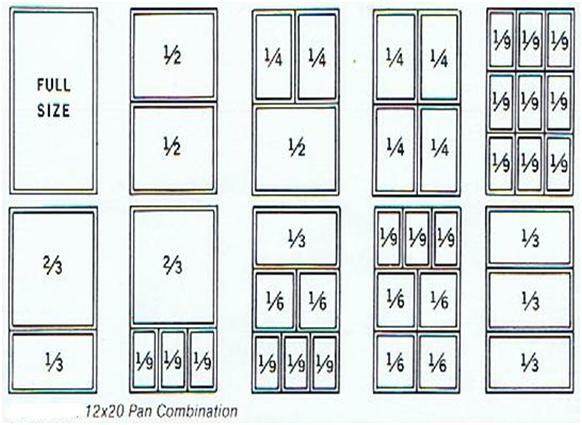 What Are All Of The Food Pan Sizes And Combinations Available? Where Can You Start When Committing To "GO GREEN?" Start at the loading dock and evaluate how much potential waste material comes in and how much waste goes out (both wet and dry waste). Seek out suppliers that practice sustainability. Ask if products are available with reducing packaging material. Buy from local sources to reduce transportation emissions and help support local economies. Consider adding disposers, food/paper waste pulpers or extractors or contact a commercial composting company to significantly reduce land fill waste. These methods also reduce trash carting costs due to trash volume reduction. Consult local codes prior to purchasing disposers as some water treatment facilities are not equipped to treat added particulate matter in the waste water. Continue to enforce and expand upon current recycling programs for card board, paper and beverage containers. Seek out suppliers of premium beverages who provide product in bulk and dispense in cups to reduce cans and bottle waste. More development and marketing of filtered premium water dispensers will continue to be introduced. Consider using unbleached napkins, bags and paper goods or products with recycled post consumer content. Explore increasing sources for biodegradable disposable products like tray, cups and food containers. Consider going without trays in cafeteria settings. This saves cost, reduces waste and ware washing resources. Reduce water consumption. Repair leaking faucets, add low flow faucet strainers, install hands free photo cells on hand washing sinks, turn off free flowing scraping troughs on soiled dish table and always consider water saving design features in your next equipment purchase. Saving water also reduced sewer discharge and operating cost to your operation. Manage FOG (fats, oils, and grease). Consider selling your used fryer oil to a vendor for refinement and use as bio-diesel fuel. Insufficient FOG recovery will eventually clog building drain lines. Make sure grease traps are operating efficiently so grease stays out of municipal sewer lines and wastewater treatment facilities. Improper containment and disposal of FOG adversely affects the environment and is difficult to treat. Watch for increased regulation and monitoring of grease recovery and subsequent charged by local agencies having jurisdiction for non compliance. If possible, schedule times to operate your dishwashing equipment. Consolidate and develop a manageable backlog to wash wares for maximum equipment output and controlled energy consumption. Avoid running equipment during low volume periods and idling equipment during operational lulls. Many kitchen appliances can be turned off or turned down during low volume periods, such as toasters and cooking equipment. Walk in cooler and dry storage lighting can be turned off when not in use. Consider installing motion sensing light switches. Have all refrigeration systems serviced and cleaned regularly for optimum performance and considerable energy savings through efficiency. Be suspect of incorrect operating temperatures, compressors that run continuously or are short cycling.